Hi, I am interested in your 1930 Ford Other Ford Models (stock #1696-TPA) listed on Autotrader for $29,995. I'd like to get more information about this vehicle and confirm its availability. 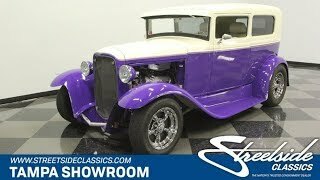 With a fuel-injected V8, custom A/C interior, and striking colors outside, this 1930 Ford Sedan Streetrod is a complete and thoughtful custom build. It takes a good bit of time to create a stylish build like this. After all, you not only have a full purple and white two-tone package, but as you get closer, you can see that a triple pinstripe surrounds the whole car. And you need a smooth pant package for a car this smooth. Its got great details, like the color-matched headlights with blue-dot lenses, integrated windshield overhang, integrated taillights (with third brake light in the body,) and smoothed door handles. Plus, those fenders have a sleek shine as they highlight the curvy wheel arches. And beneath that are front/rear staggered tire sizes to give this a great street rod stance. In fact, you have adjustable rear airbags so that you can get this stance exactly how you like it. Its such a great modern look on this classic that only minimal brightwork is needed. So it can be used to emphasize the best pieces like the American Racing wheels, bumper bar, and engine thats on display for the world to admire. Pop the remote door openers to reveal more of the carefully crafted custom look as the cream color nicely coordinates with the exterior. You have dual leather bucket seats with modern bolstering, headrests, and comfy cloth inserts. This coordinates with the side panels, headliner, dash, and center console to create a uniform total package. This has the best in modern comfort, including cold air conditioning, power windows, and provisions for a stereo mounted in the headliner. You get a banjo-style sports steering wheel mounted on a tilt column. Beyond that, youll love how the purple glow of the digital gauges coordinates with the dashs pinstriping to give you a thoughtful custom look inside and out. While side covers for the front come with the sale, we like the engine bay on display because it really gives everyone something cool to see. Fords 302 V8 looks great with the block painted purple to match the exterior and firewall. Plus, bright valve covers, alternator, and other accessories add the right flair. And keen eyes will also notice one of those bright pieces is also the upgraded fuel injection. Plus, you can see theres a Spectre performance air intake to let this V8 inhale deeply, and ceramic coated headers are there to exhale with authority. So its a powerful package thats easy to enjoy. It even has the right supporting components like an MSD ignition and aluminum radiator w/electric fan (to help keep you running cool even in traffic with the A/C pumping.) And as you look underneath the car, youll not only see a great color-matched presentation, but also nice features like front disc brakes and a three-speed automatic transmission. This is a thoughtful build, and the sale even comes complete with a car cover. So if you like a complete and custom icon, dont let this 30 Ford slip away. Call today!! !